Lyme Disease. Over the years of my own personal research, I have found - at least in my case - that poor gut health leads to the inability to fight off diseases and infection. I contracted Lyme Disease that progressed until I was barely able to walk and started to affect my brain. I was put on longterm antibiotics, which further destroyed my already impaired gut. After the antibiotics, I realized I needed to heal from not only the aftermath of the antibiotics, but from the "vegan/vegetarian" diet I'd put myself on. (Again: World's worst vegan/vegetarian!) I followed the GAPS diet for 2 years, the maximum amount of time recommended to be on the diet. The point of the short-term diet is to heal and seal the gut lining, which may in turn diminishes or eliminates most symptoms of poor health. (Here is my 9 month update, 1 year update, 1 yr 6 mo update, and 2 year update.) While my gut healed significantly, I now realized I was faced with another common ailment that many face after GAPS: hormone imbalance. To balance out my hormones, I am tracking macros, focusing on micronutrients, and intending to balance out the deficiencies I have. Each month I feel like I am more balanced and more healthy, but I know this is an ongoing work in progress. to hit my macro numbers (macros are proteins, fats and carbs). While on the GAPS diet, you go gung-ho with the fats, which you need to heal and seal the gut lining. However, once the gut lining was repaired, I noticed a correlation between eating too much fat, and my hormones being thrown off. So, I started tracking macros (got my numbers through a friend who does nutrition), and noticed an immediate shift in the right direction once I ate less fat and more carbs. So staying balanced with my macros is a goal of mine. to hit more micro nutrients. Micronutrients are vitamins and minerals found in food like magnesium, copper, zinc, etc. I know, based on my talks with doctors and my own research, that I am deficient in copper, selenium, chromium, niacinaminde, zinc, folate and magnesium. I've researched the proper foods to begin incorporating to ensure that I keep getting those micronutrients in my body, which hopefully will help balance my hormones. Ha, so let's start it right off with a bang, eh?! #letmelive! 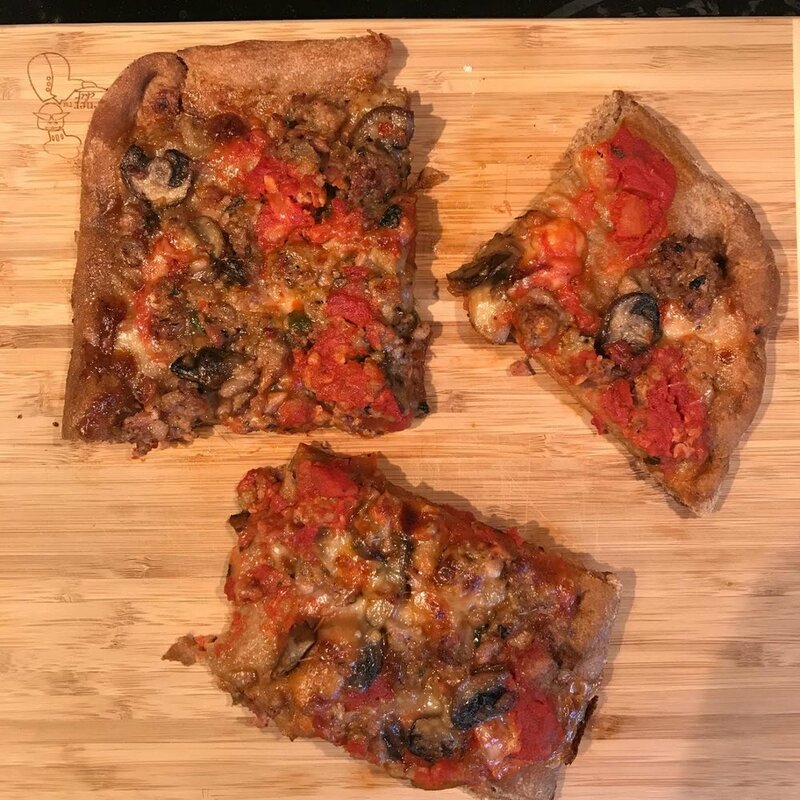 Sunday night I had homemade pizza made with an organic whole wheat crust, onions, sausage, and organic tomato sauce. This also had mushrooms, which I have been trying to incorporate into my diet lately because they've got copper and selenium, two micronutrients I'm deficient in. The only thing that would've improved this pizza, health-wise, is to have some veggies. We actually had peppers from the garden we wanted to put on, but we were hangry and totally forgot to add them! Breakfast - Starbucks oatmeal with nuts and fruit (definitely not my preferred breakfast choice but I had to just take what was available, as I didn't prepare well and was running around on empty). 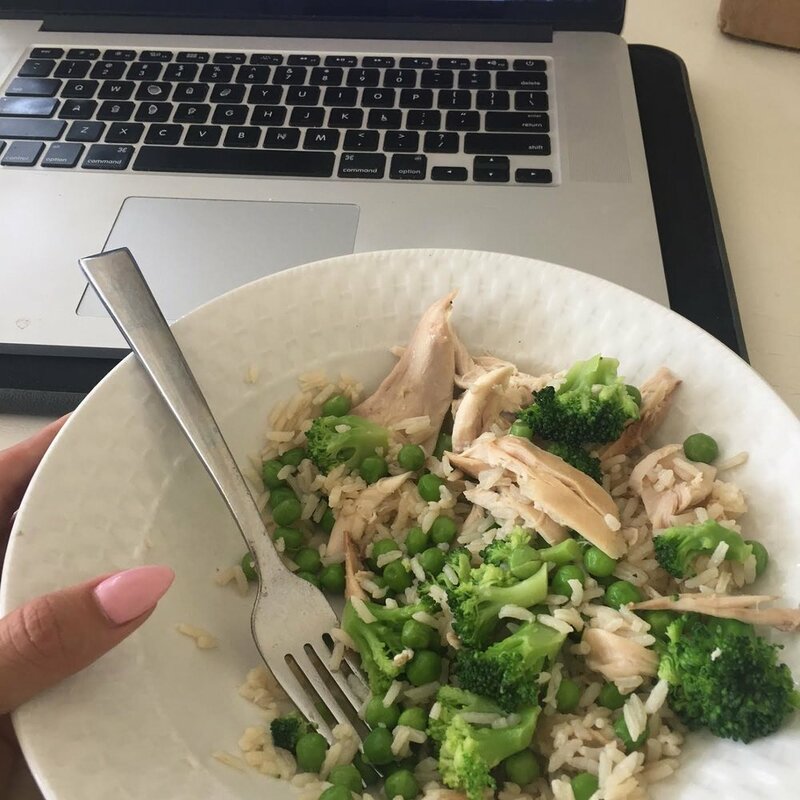 Lunch - organic chicken, jasmine rice I cooked in homemade bone broth, and organic peas and broccoli. Broccoli is high in folate, another micronutrient I'm deficient in. 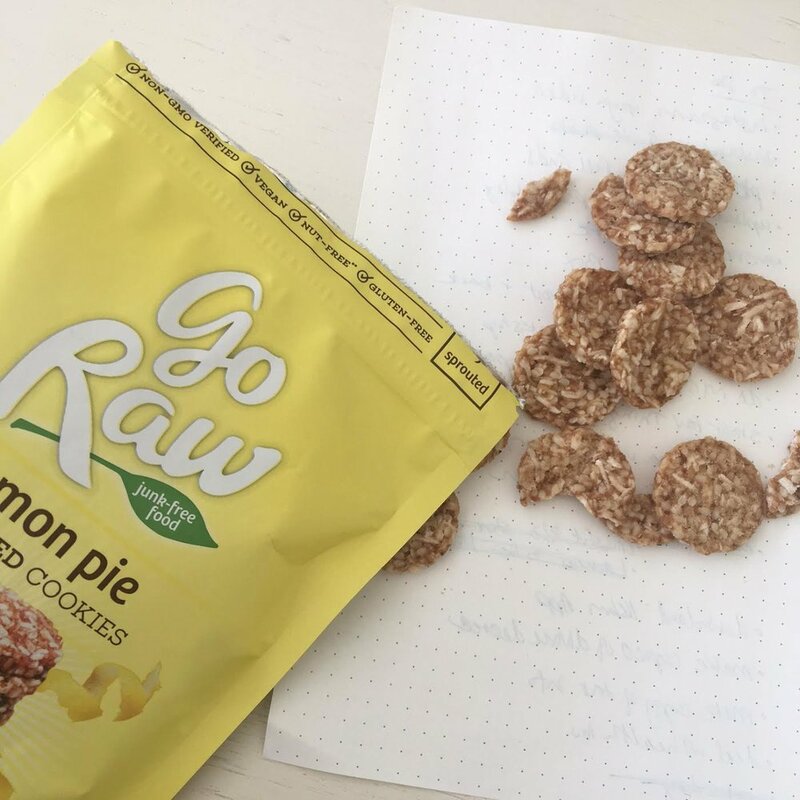 Snack - (pictured on Thursday) Go Raw Lemon Cookies - these are made with sprouted sunflower seeds which are a good source of copper, another micronutrient I'm deficient in. Post workout - SFH protein shake. Dinner - wild cod baked with lemon and a little ghee, organic veggies including cukes, tomatoes, and peppers, and rice made in bone broth. To dress it, I mixed sauerkraut juice, Kasadrinos olive oil, ACV and salt and pepper. Dessert - I was hungry that night and still under all my macros, so I made homemade cookies using the recipe here, and had three of those that night. Breakfast - two pasture raised eggs, a slice of homemade sprouted spelt bread, and organic blueberries. I also drank 2 cups of bone broth after that. Favorite pre-workout (use code yogabycandace for a discount). The pre-workout has lots of micronutrients in it and is excellent for brain function. Lunch - organic chicken, sweet potato, salad and sauerkraut and the dressing was ACV, lemon juice and olive oil with salt and pepper and ground ginger. Dinner - spaghetti squash I cooked in the instant pot (love this thing, it cooks everything so freaking fast! ), organic red kale I cooked in bacon fat, and ground bison and sweet onion. I also added organic, no-sugar tomato sauce and fresh garlic (garlic is excellent to kill of any bad bacteria!). Breakfast - smoothie I made using a little goat kefir (excellent for gut health), a little grassfed whole yogurt (also great for gut health), a packet of cordyceps (great for gut health and adrenal support), a scoop of collagen peptides and organic blueberries. I also chopped up a few of those cookies I made on Monday and used them almost like a granola. 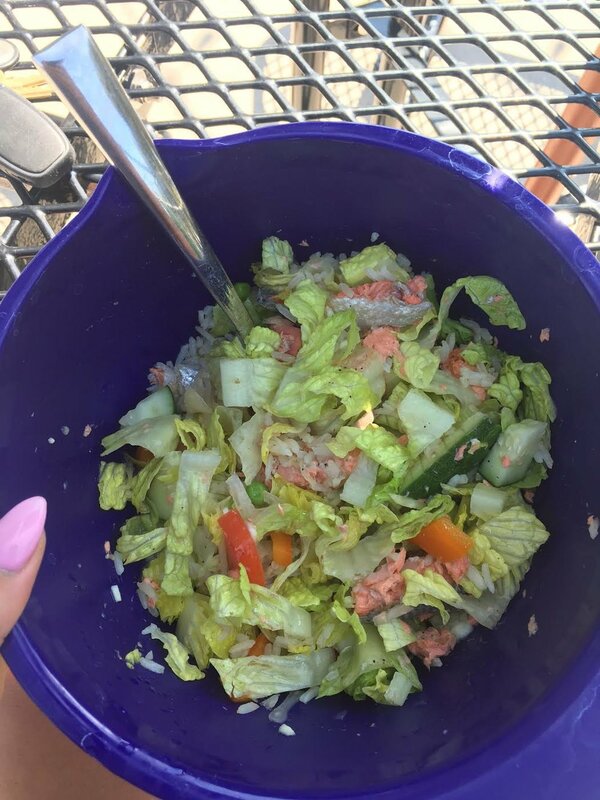 Lunch - baked wild salmon that I chopped up a put into a salad with romaine, tomatoes, cucumbers, raw garlic, and peppers. I added jasmine rice cooked in bone broth and dressed it all with avocado oil, ACV, and sauerkraut juice with salt and pepper. During Workout - Rootz Pre-workout mixed with Vital Proteins Collagen Beauty Water. Dinner - Spaghetti Squash, bison, onion, raw garlic, kale, tomato sauce. Snack: Grassfed organic yogurt with organic blueberries and pre-workout by Rootz Nutrition. Dinner: Spaghetti squash with bison, raw garlic and a side salad. Dressing: ACV, lemon juice, olive oil, ground ginger, salt and pepp. So, initially I was not into posting about this. There's something about sharing what you eat that makes me feel, I don't know, almost... vulnerable?! Which is dumb - we all eat - but I guess I was nervous about being judged. In looking back at the last week or so, I feel like there is definitely some room for improvement. My initial thought is that I wish I had a more varied diet, but the problem is that I am cooking for one, so it's hard to vary too much without having excess. 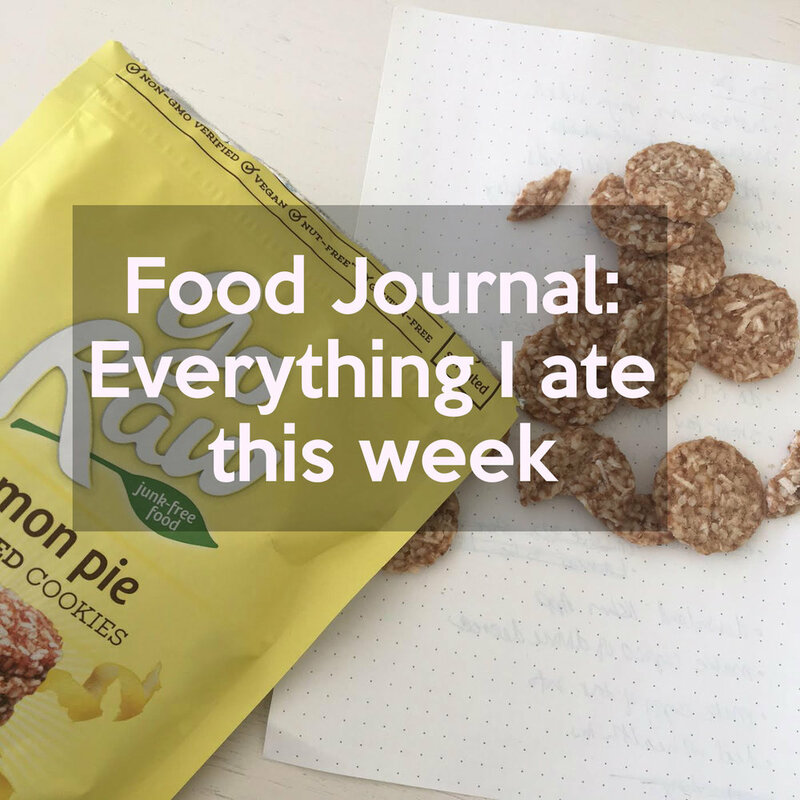 I do kind of like tracking my food and sharing here, though. Is this something you guys would want to see again in the future? I'd love to hear your thoughts! PS: Looking for food inspiration? Check out our recipes in the navigation bar at the top of our page- most are written by our food writer Allison of Seek Satiation.